In the first of a specials series, FESPA.com speaks to some of the companies that are exhibiting at the European Sign Expo this year to find out about the services they offer and what we can expect from them at the show. Caption: Domino Sign will use the European Sign Expo tho year to showcase a range of its products and services. The European Sign Expo should be a key date for all members of the global sign industry. No matter what area of the market you specialise in; be it traditional sign-making, LED signage production or interior display work, there will be something on offer for everyone at the event. Taking place alongside the main FESPA 2018 show at the Messe Berlin from May 15-18, the European Sign Expo will play host to some of the most innovative and forward-thinking companies in the global sign market. One such company is Domino Sign, which has specialised in LED-based lighting devices for the past 11 years, working with sign-makers across the market to develop new and exciting products. 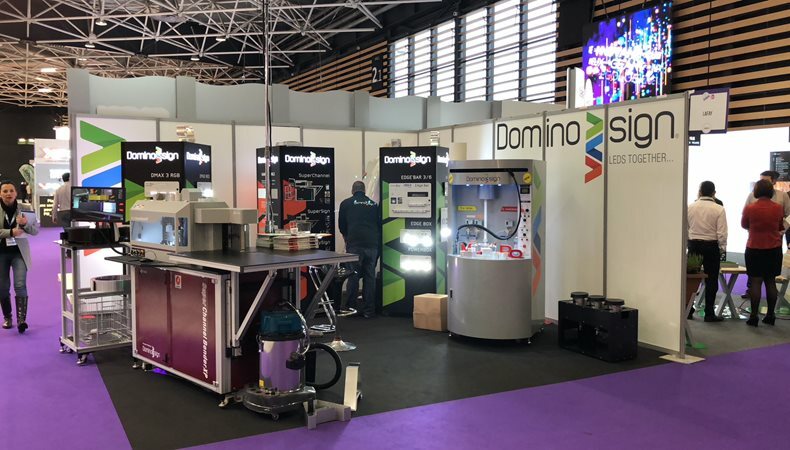 FESPA.com spoke with Alexandre PY, sales manager at Domino Sign, to find out more about the services on offer from the company and how the firm is able to support businesses of all shapes and sizes. FESPA: Can you tell us about your company and the services you offer? PY: Working with sign-makers, we provide a range of LED-based lighting devices. This collection of LEDs offers the pleasure of creation, the comfort of simplicity and the benefits of quality. We are also the main European distributor of SDS’s Channel Bender machines from South Korea. We offer aluminium flats coils, stainless steel mirror or coated aluminium coils and an aluminium coiled profiles called ‘Letterbox’, which has been specially designed for sign-makers. How was 2017 for Domino Signs and what has 2018 been like for you so far? Last year was a very good year for us, having launched many new LED products such as dot-to-dot LEDs, edge lightening modules and very wide-angle back lightening modules. As for 2018, it has started as our most dynamic year for our Channel Bender machines. Can you tell us about some of the new products you have on offer, as well as some of the solutions you will bring to market later this year? This year, we have launched the brand new Super Channel Bender XP, equipped with a revolutionary new ‘punching tool’ that will literally do without welding for the letter box background and also the closing of the edge. With the launch of this new SCB XP, we will market flat coils of glossy white aluminium interior and exterior. So, with the punching-tool of the SCB XP on edge, combined with this new pre-painted aluminium coils, this will bring a considerable gain in the realisation of 3D signs. However, the great innovation for this year will be a unique and completely new product in the world of the brand – the Resin Doming Sign machine. But what is this? Well, it is a first in the world of the advertising sign, as this machine will very precisely deposit a thin layer of coloured resin on the faces of the signs to give a doming, or convex, effect to the sign. Looking ahead to the European Sign Expo, why have you decided to exhibit this year? The FESPA shows are always one of the big events not to be missed. Each year, we are in attendance with our machines and our LEDs. We have new things to show every year! And finally, what are your main hopes and goals for the European Sign Expo 2018? As at every show and like all the exhibitors, we want to meet up with our current customers and speak with potential, future clients to give them an overview of the evolution of our machines and new LED products. Human contact is essential for us! Domino Sign is just one of many leading companies exhibiting at the European Sign Expo this year. Positioned alongside FESPA 2018 show, the event will serve as a hub of information for sign companies from around the world, allowing them to get up close and personal with some of the latest technologies on the market.